The Democrats on the Senate Environment and Public Works Committee hammered Andrew Wheeler on Wednesday for his role in systematically rolling back environmental protections at the Environmental Protection Agency (EPA). Wheeler, a former coal lobbyist, has been the agency’s acting administrator since his predecessor, Scott Pruitt, resigned amid ethics scandals in July. Trump nominated Wheeler to become the permanent head of the agency last week. Sen. Bernie Sanders, I-Vt., who caucuses with the Democratic Party, reproached Wheeler for not even mentioning the words “climate change” during his opening statement at a time when the scientific community is urgently calling for drastic cutbacks in fossil fuel use to avert irreparable environmental damage. “I would not call [climate change] the greatest crisis. No sir. I consider it a huge issue that has to be addressed globally,” Wheeler said. Sanders responded that the U.S. has the strongest economy in the world and leadership by the EPA could influence the entire international community. He noted that many Republican senators refuse to acknowledge the danger of global warming and that the EPA head should be pressing the matter with Congress. 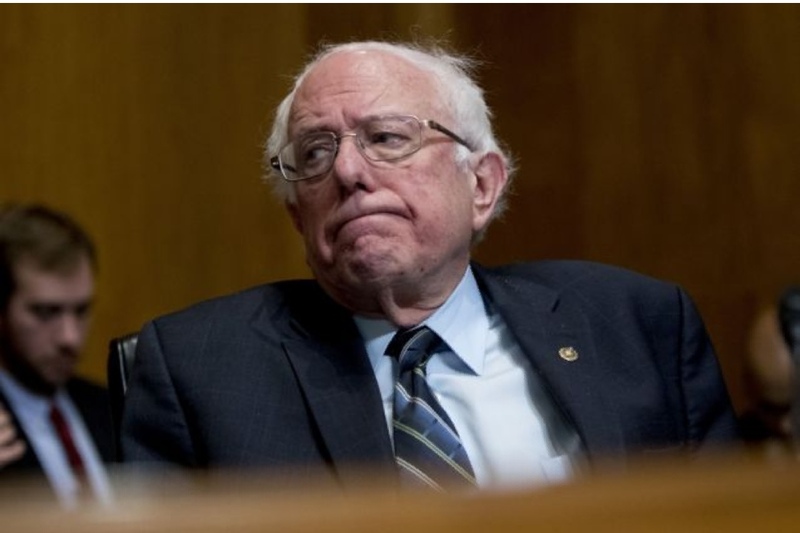 “Will you provide the leadership in this country and the world to say that we are concerned about the future of this planet for our kids and our grandchildren?” Sanders demanded. Wheeler said that rather than advocating for climate action, he would continue to implement the laws that Congress has already passed. “We are concerned about the future of the planet for our kids and our grandchildren and we are implementing the laws that have been passed by Congress,” he said. Sen. Bernie Sanders, I-Vt., reacts after questioning Andrew Wheeler as he testifies at a Senate Environment and Public Works Committee hearing to be the administrator of the Environmental Protection Agency, on Capitol Hill in Washington, Wednesday, Jan. 16, 2019. Sanders asked Wheeler if he agrees with scientists that climate change is causing larger and more destructive wildfires in the West. Wheeler said that while climate change “probably [has] some relation” that “the biggest issue with the wildfires has been forest management” — echoing Trump’s views, which are disputed by forestry experts. Sen. Cory Booker, D-N.J., said that Wheeler’s policies — such as repealing and replacing the Clean Power Plan — “fly in the face” of the recommendations from the Intergovernmental Panel on Climate Change and even by EPA’s own scientists. He said that Wheeler when Wheeler took office as Pruitt’s deputy he swore to protect human health and the environment, but that he’s consistently taken actions that undermine that mission. “It just seems the consistency of actions you are taking [from] weakening rules to undermining the sense of urgency that across agencies [scientists] are telling us that we face growing, growing challenges. Not just now but really over the next 25 years,” Booker said. Wheeler responded that he believes the EPA is moving forward on reducing greenhouse gases through the Affordable Clean Energy (ACE) Rule. “My career staff tell me that our proposal is going to get us a 34 percent reduction in Co2 and that the Obama proposal would have gotten between 33 and 35 percent reduction,” Wheeler said. Booker countered that data from Wheeler’s own scientists contradict those claims. Sen. Ed Markey, D-Mass., cited the fourth National Climate Assessment’s (NCA) dire forecasts for the harm global climate change will have on American infrastructure, public health, and the economy this century as evidence that Wheeler should take a leadership role in protecting the environment. The 1,600-page report was compiled by a consortium of 13 federal agencies and released by the Trump administration. Markey asked Wheeler whether he disagreed with their conclusion that the actions currently taken by the EPA do not approach what’s necessary to avert catastrophe. Wheeler said he’s only been briefed on the NCA once and that he isn’t prepared to discuss it at this time. 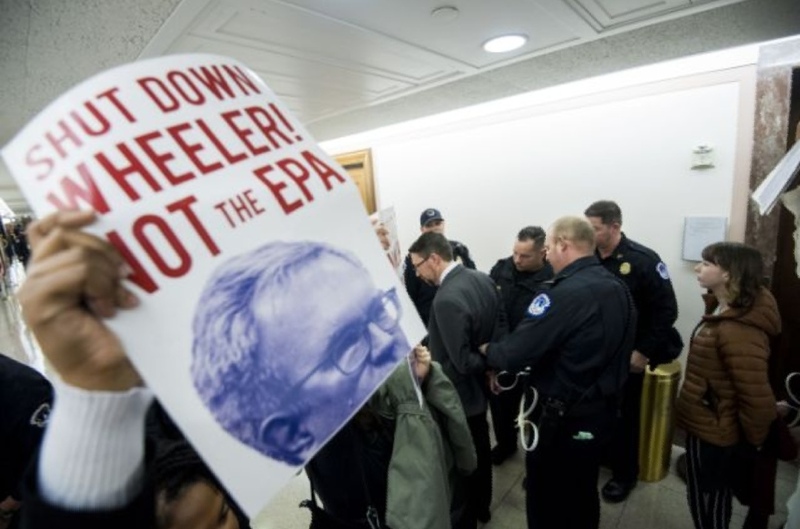 Several protester are arrested by Capitol Police after being pulled out of the confirmation hearing for Andrew Wheeler to be administrator of the Environmental Protection Agency in the Senate Environment and Public Works Committee on Jan. 16, 2019. The U.S. Chamber of Commerce, a lobbying group for American businesses, sent a letter of support for Wheeler’s nomination to the committee on Tuesday. “Mr. Wheeler’s substantial public service experience makes him an excellent choice to lead the EPA. He began his career at the EPA, where he worked on toxic chemical, pollution prevention and right-to-know issues, and he was awarded the EPA Bronze Medal twice for his accomplishments,” wrote Neil Bradley, the chamber’s executive vice president and chief policy officer. 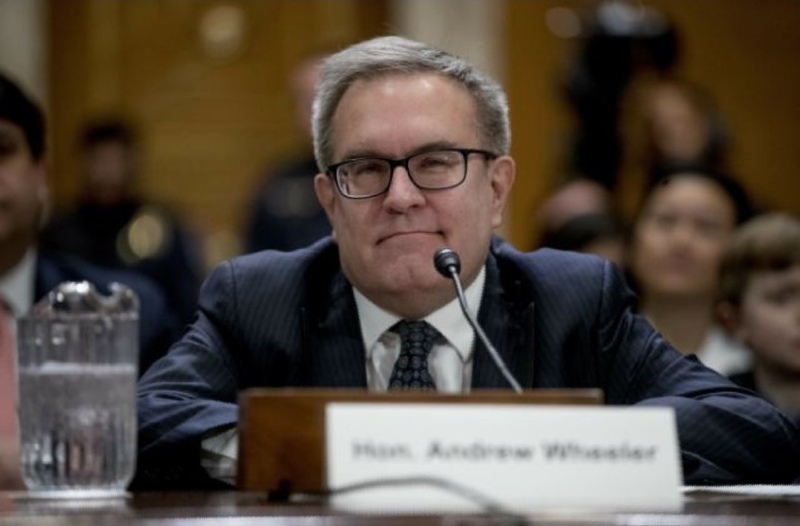 The environmentalist community has been united in urging the committee and the full Senate to oppose Wheeler’s nomination. Ahead of the hearing, Rhea Suh, the president of the Natural Resources Defense Council, released a statement saying Wheeler should not be promoted. “The Senate should reject him immediately. The EPA is our last line of defense against toxic pollution and environmental ruin. The American people expect its chief to honor that mission and protect the environment and public health – not go to bat for polluter profits at the people’s expense,” Suh said. Michael Brune, executive director of the Sierra Club, released a similar statement, arguing that the American people cannot afford to have the EPA run by someone who values corporate polluter profits more than clean air and water. No further hearings on Wheeler’s confirmation are expected and the vote has not been scheduled yet.